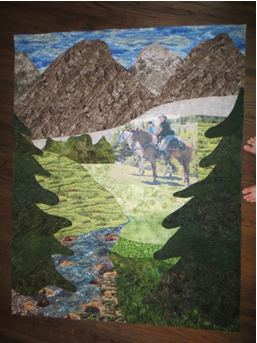 Mary Ellen (Bert) went on a dream vacation: horseback riding in the mountains. She flew out to Calgary and caught a ride to the stables and was off. The picture is photo transferred onto fabric and then the quilt is built out from it. 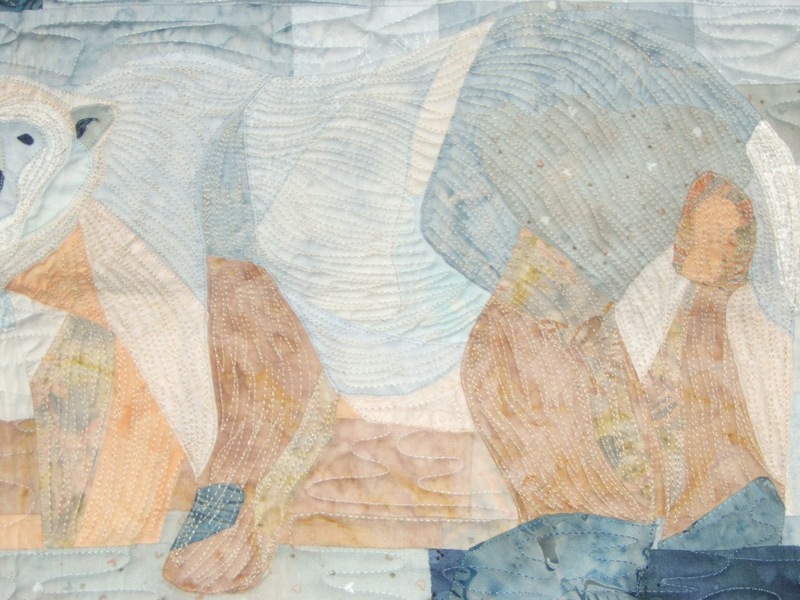 Bert travelled over many terrains during her horseback experience. Pictured in the quilt are the mountains, shale fields, plateaus, hills, a stream and some varied vegetation. 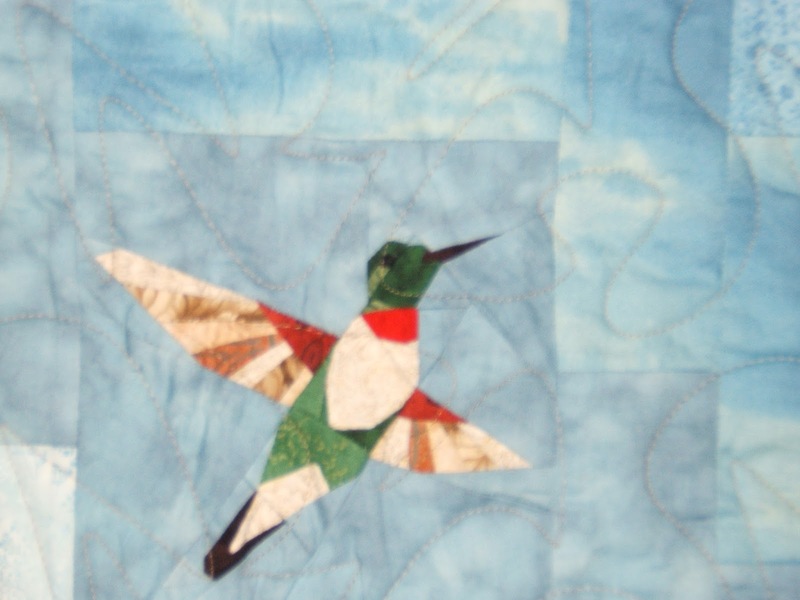 I designed this quilt for my brother Ron. 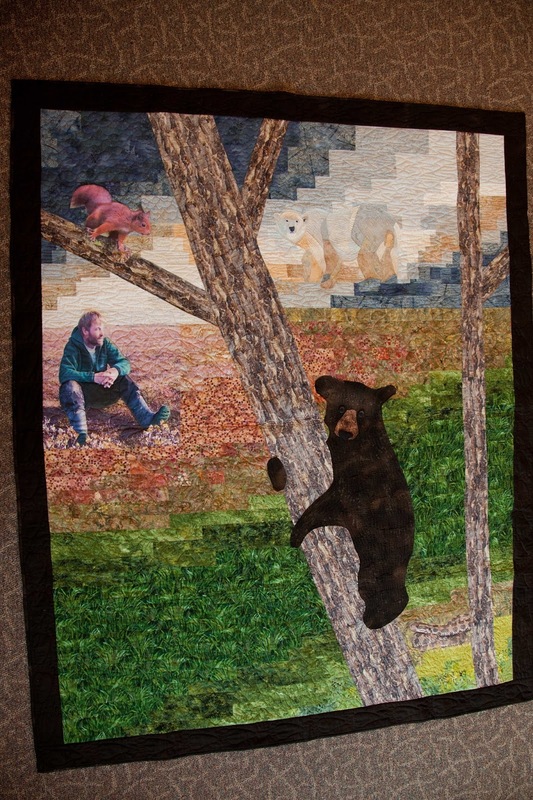 His love of the outdoors and animals are a huge part of his life and work. Ron is pictured on the tundra in the north during the time when he was working with the polar bears. 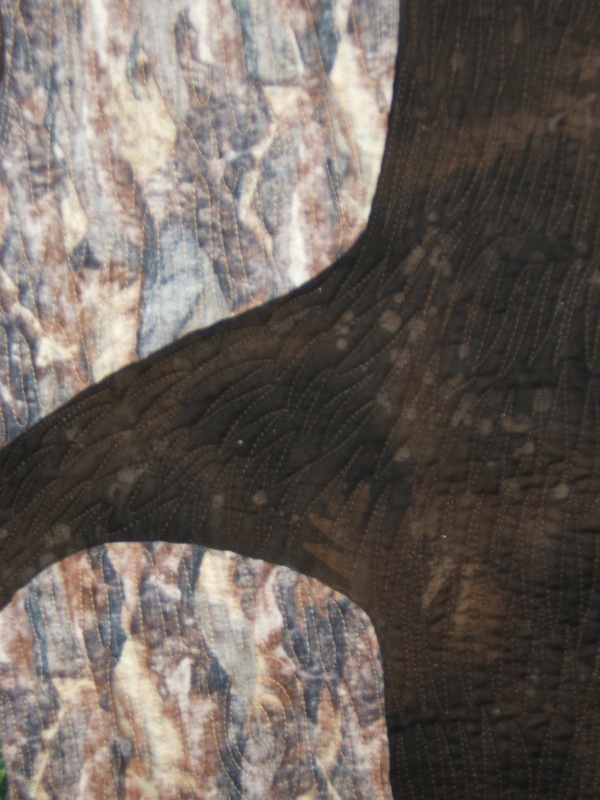 I ghosted a polar bear into the sky to represent that special project he worked on. Note a Mississauga rattlesnake is coiled in the grass at the base of the tree, a black bear cub is part way up the tree scaring a red squirrel on an upper branch, these 3 creatures have been in studies of Ron's as well. Details of the polar bear, the fur on the bear and the tree trunk. 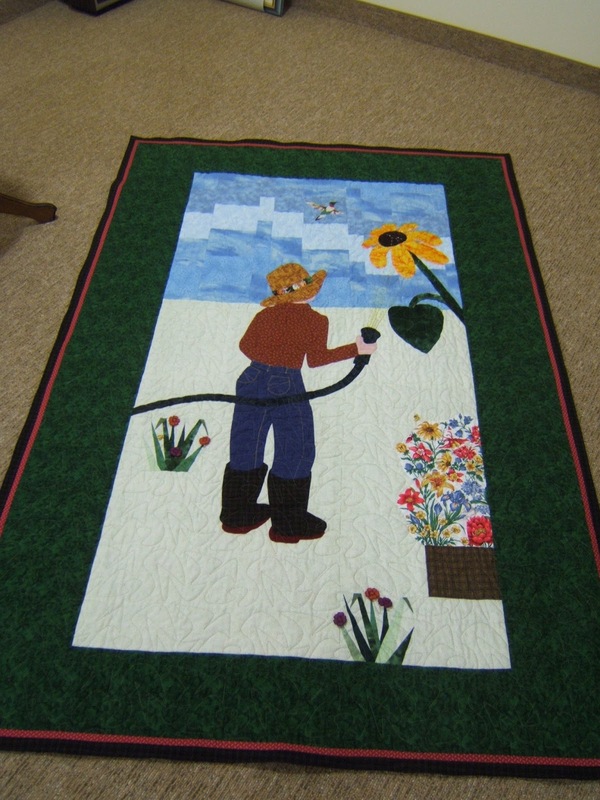 Kathy is my youngest brother, Ron's wife and her quilt is the first in this series of story quilts. She is a great gardener who has beautiful flower gardens surrounding her home. 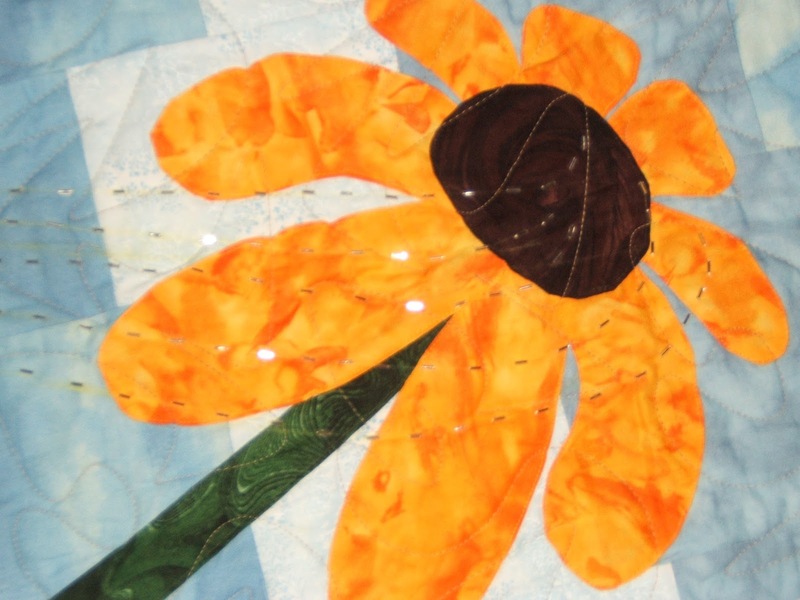 The close up view of the sunflower shows the beading I applied to the quilt to imitate water droplets. I remember how tall Kathy's sunflower grew too. At their log home I remember Kathy pulling on her rubber boots to go take care of her gardens or to go out with the dogs. 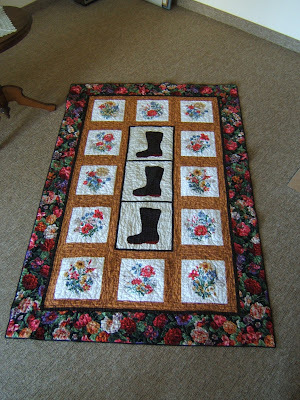 I just had to have rubber boots on the back of the quilt.